Are you waiting for the halftime shows and ads more than the game itself like me 🙂 You don’t have to miss anything getting the food ready.Here is a an easy make ahead filling for the slider.Slow cooker is generally used for making such delicious and juicy meat recipes which takes about 8-10 hours to get the desired results. But you can cut down the cooking time by 1/10 th using a pressure cooker instead. I cannot imagine going through the permeating aroma of beef cooking in the slow cooker at night and I telling myself, “You can go to sleep now…beef will be ready by tomorrow!” Is it not agonizing !! I mean if you have a large space and u can let the meat cook without aroma wafting all around the house then by all means go for the slow cooker method. But if you have all doors leading to a not so ventilated kitchen it is no brainier to use a pressure cooker and finish off in one go. Sirloin meat is economical compared to minced meat. You need not spend time shaping the beef into patties instead haphazardly shred the cooked meat with two forks :)so no worry of cutting into pieces too. 1. Wash the beef chunk, pat dry and marinate with spices and set aside for 20 minutes to an hour. 2. In the pressure cooker add 2 -3 tsp of veg oil and saute the onion till translucent then add celery and green chili saute for two minutes and add the marinated beef (cut into 2 or 3 pieces to fit into the pressure cooker if needed).Cook on low for first 20 minutes then raise to low-medium setting and cook until 5-6 whistles depending on ur pressure cooker. Insert a fork to check if it is cooked well. If using slow cooker then :- In a pan add 2-3 tsp of veg oil and saute onion till translucent then add celery and green chili saute for 2 mts then add marinated meat and slightly brown the edges.Transfer the meat and onions to the slow cooker and pour 1-cup of chicken stock/beef broth cover and cook on low settings for 8-10 hours. (check in between and add more stock if needed so it does not dry out completely).According to your slow cooker you may have to set it in warm after 4-5 hours of cooking. One hour before serving continue with step 3. 3. In a large pan add all the ingredients for sauce given above and heat on a low flame till everything is combined then add the cooked meat chunk and simmer until all the sauces are absorbed completely. 4. Let it rest for 10 minutes.Then using two forks simply shred the meat by holding it with one fork and shredding it with the other fork. Note : Remember to pull along the grain so you don’t end up with too fine shreds that will simply fall apart and will not hold together on a slider. 5.Assemble the sliders with the toppings just before serving. Hope you like the shredded beef which is oozing with flavor.Let me know if you liked it. I am for half time show n ads, this game is not for me, if cricket then I am all years, this year its five minutes from my house n v have party to go, don't know how we will make it. Sliders are perfect. You can go to sleep now …..beef will ready by tomorrow.lol…punch line…looks amazing..
its looks so yummm… tempting clicks..
Yummy… tempting. Nice click especially the last one. Super. ur an amazing photographer..Wish it was a veg Sliders :(.. Feeling like grabbing right away..
Yummy dear 🙂 Very tempting . 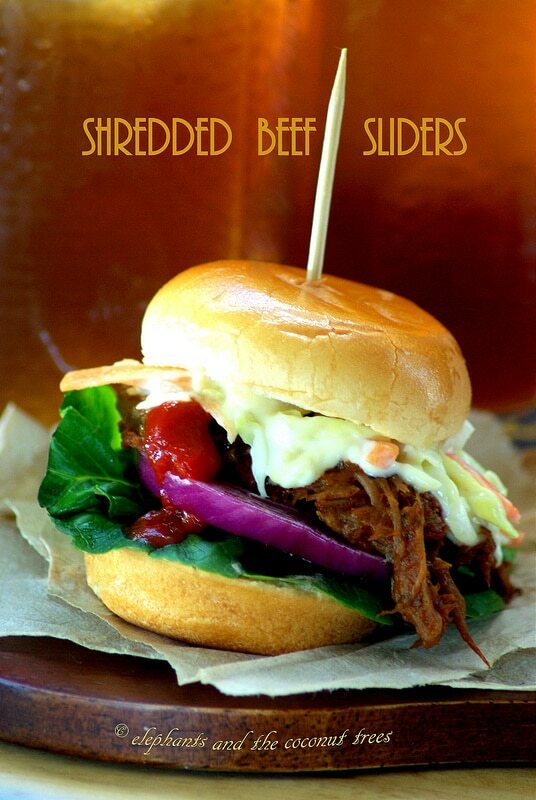 Very inviting sliders .My huss is a great fan of super bowl and i can make him some veggie,chicken sliders …. Beef is a taboo for us. But I am loving the use of it for a gorgeous soft stuffing into the bun.